Home page - Tenco Services, Inc. Assign to us via this Website; Telephone 800-621-1313; Email claims@tenco.com Transparent, Prompt and Consistent Communication with all parties is a primary objective of our company. Sextant Claims Administrators is a third party property and casualty claims management company. We successfully administer and adjust insurance and self-insured programs across the United States and are known in the industry as delivering transparent claims solutions by highly experienced claims professionals. Tenco Transportation Services is a subsidiary of Tenco Services, Inc. We offer experienced transportation specialists in our branch offices. We offer experienced marine and cargo surveyors and transportation specialists in our branch offices of Nashville, Atlanta, Cincinnati, Louisville, and Memphis. "Ain’t Skeert!" "Dream Team" "Bidness is Good"
Eight staffed claims offices, two resident adjuster offices and three associate offices throughout the majority of the Southeast provides direct services to handle your claim assignments. Click here to view our office locations. If you would rather not use email, phone or fax, you can send assignments to us directly by clicking here for access to our Web Form for prompt assignment. 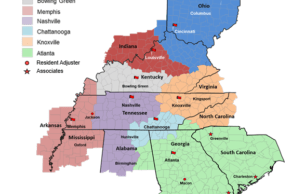 What makes Tenco Services, Inc. the superlative independent property and casualty claims adjusting company in the mid-South? Over 70 years of Experience!